With new smartphone apps, Toyota, Lexus and Scion get their own customer-facing appearances, but the app functions the same with each brand. 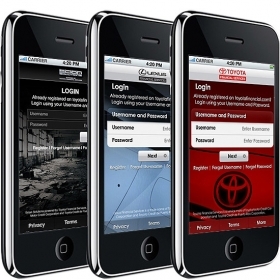 Toyota Financial Services has launched an app that lets Toyota, Lexus and Scion customers check their accounts and pay bills using an Apple iPhone. "It's the first app that allows the customer to register from the phone directly," said Karen Ideno, corporate marketing and brand manager. She said Toyota, Lexus and Scion get their own customer-facing appearances, but the app functions the same with each brand. Starting this month, Toyota Financial Services customers can use their iPhones to shoot a picture of a Quick Response bar code that will come in their monthly statements. That automatically enters the customer's information into the system, according to the company. Other apps require the customer to enter the data on another computer before downloading the app, Toyota Financial Services said. More than 900 people downloaded the app on the first day after it was launched last week, even before it was publicly announced, the company said. Toyota Financial Services said nearly 35 percent of its customers pay their bills online. The company also expects to launch apps for other smartphones.